In part one we discussed Chelsea centre back Alex and full back Paulo Ferreira. In this post we will discuss two more Chelsea players who have overstayed their welcome. A product of the FC Porto youth system Henrique Hilario is known in football circles as the perennial third choice goalkeeper. 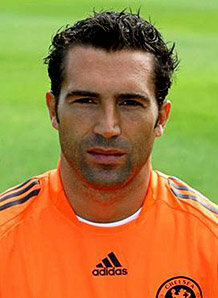 Signed in the year 2006 he has only made about 20 league appearances for the club. Some good performances notwithstanding his career as a goalkeeper never really took off. His only real chance arrived when both Petr Cech and Carlo Cudicini were injured in horrific incidents in the same match against Reading. He received a run of games after that but was never good enough and was immediately relegated to the bench following Cech's return to fitness. He had his only promotion when Cudicini left Chelsea for London rivals Tottenham but has now been replaced as second choice with ( a not so young) Ross Turnbull. With Chelsea loanee Thibaut Courtois and Matej Delac both bound to overtake him into second and fourth choice respectively it is time for Hilario to hang up his boots or look for another club. Chelsea right back Jose Bosingwa was one of the two early signings made by new Chelsea manager Luiz Felipe Scolari in 2008. Signed for €20.6 million from FC Porto he soon became famous for his darting runs down the right flank as similar runs were made by full back team mate Ashley Cole down the left flank. Known for his accurate long range goals misfortune soon struck his so far wonderful Chelsea career(already having spurned Bayern Munich's attempt to sign him) when he sustained a knee injury against Aston Villa in October 2009 suspended him from the football scene for a year. Following the rise of Branislav Ivanovic, Bosingwa was expected to not be seen in a major role but injuries to Alex and Terry pushed Ivanovic into the center back role vacating the right back seat for Bosingwa. After a few average performances he was once again expected to leave the club at the end of his contract. After the appointment of fellow Portuguese Andre Villas Boas he was reinstated into the lineup and soon received a contract extension. But with his contract coming to an end this season and some not so very inspiring performances later Bosingwa looks set to head for the exit doors.Only the lack of finding a replacement can see him retain a spot. It would only be wise on Chelsea's part to cash in when they have the chance.